2019 ENSO forecast | Climate Etc. During fall 2018, there was warming in the Central Equatorial Pacific, leading to a weak El Niño Modoki pattern, which impacted the latter part of the Atlantic hurricane season. This transitioned to a weak (conventional) El Niño in February 2019 and the atmospheric anomalies became more consistent with a conventional El Niño pattern. NOAA’s latest forecast: Weak El Niño conditions are likely to continue through the Northern Hemisphere spring 2019 (~80% chance) and summer (~60% chance). CFAN’s ENSO forecast analysis is guided by the ECMWF SEAS5 seasonal forecast system and a newly developed statistical forecast scheme based on global climate dynamics analysis. 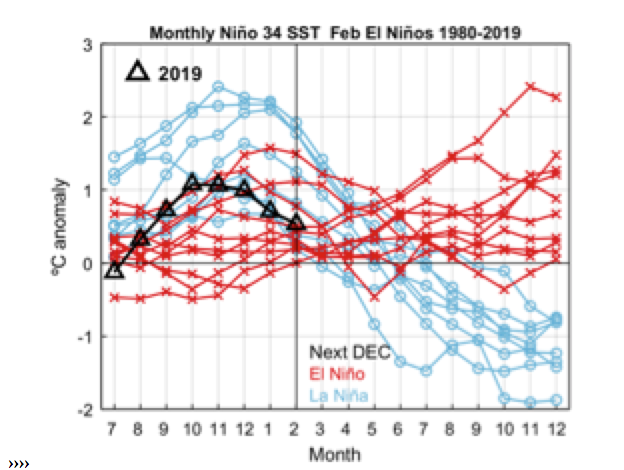 Figure 1 illustrates the recent ENSO history as depicted by monthly Niño 3.4 anomalies from 1980 to February 2019. Highlighted are 20 El Niño Februaries (Niño 3.4 > 0°C), including the most recent (+0.5°C) in February 2019. 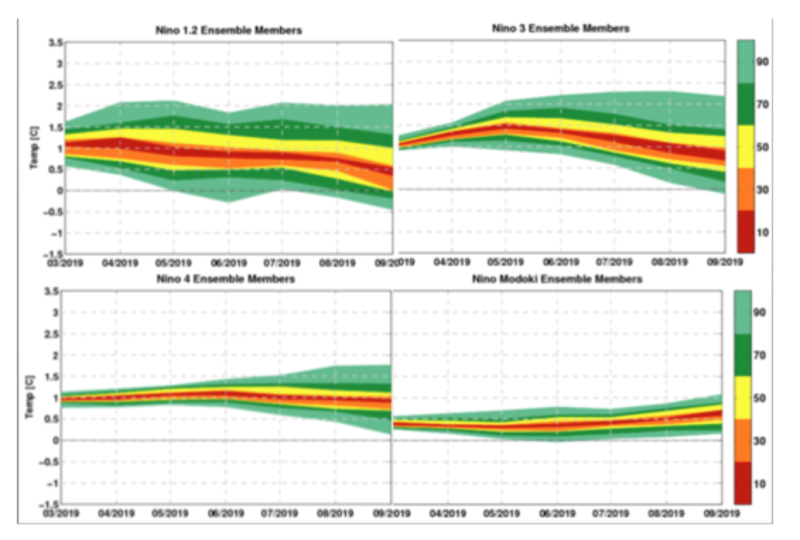 The Niño 3.4 anomalies surrounding each February El Niño event are plotted in Figure 2, showing the index evolution from the previous July to the following December. The February events that are followed by December El Niño conditions (El Niño persistence) are plotted in red, while those events that reverse to December La Niña conditions are plotted in blue. The Niño 3.4 evolution of 2018-2019 is shown with heavy black markers. ENSO behavior in late 2018 is remarkable for a steep increase from slightly negative Niño 3.4 SST anomalies in July to moderately positive anomalies (+1 °C) by October. Typically, fall El Niño intensification occurs with the growth of high-amplitude events that peak around +2°C before undergoing major reversals to La Niña throughout the following calendar year (blue lines in Fig. 2). Figure 1. Time series of the monthly Niño 3.4 SST index (5°N-5°S, 170°-120°W), with warm February El Niño anomalies (<0°C) highlighted by red markers. Figure 2. Seasonal Niño 3.4 SST anomalies surrounding February El Niño conditions (Niño 3.4 SST anomaly > 0). A. Lines trace monthly Niño 3.4 SST anomalies from July (year -1) to December (year 0) f for all February (year 0) El Niños. Lines are colored according the sign of December (year 0) Niño 3.4 SST anomalies, with December El Niños plotted in red and La Niña in blue. 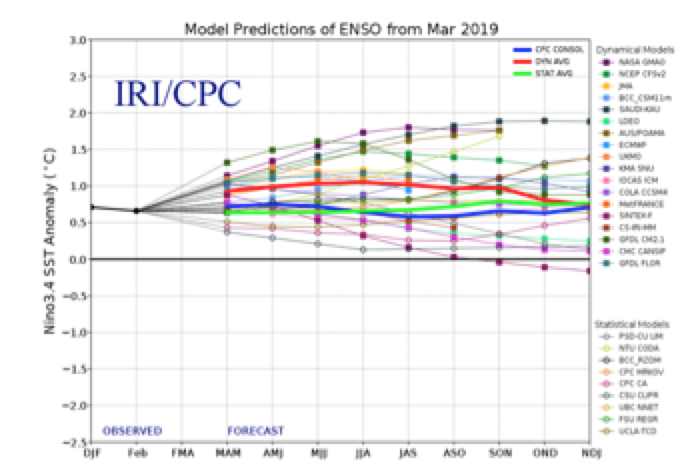 The IRI/CPC plume of model ENSO predictions from mid-March 2018 is shown in Figure 1. 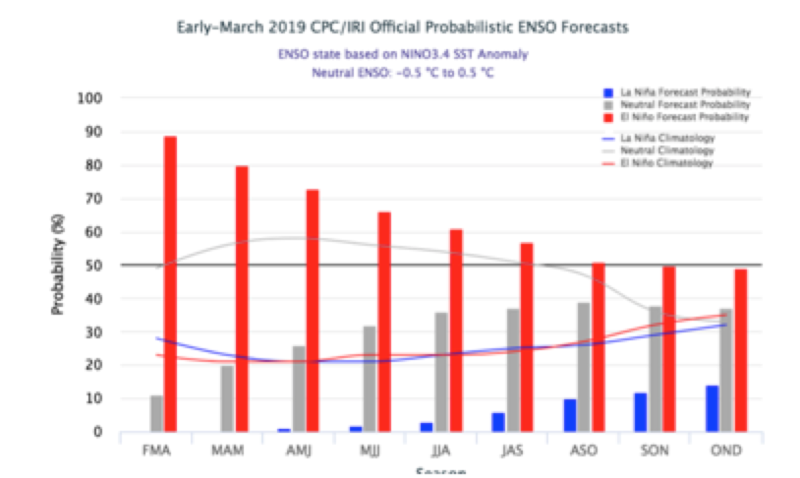 The latest official CPC/IRI outlook (Figure 2) calls for a 80% chance of El Niño prevailing during Mar-May, decreasing to 60% for Jun-Aug.
CFAN’s ENSO forecast plumes from ECMWF (initialized March 1) are shown in Figure 3, for Niño1.2, Niño 3, Niño4, and the Modoki Index. ECMWF shows a peak of Niño 3 in May 2019 and a peak in Niño 1.2 in April, with subsequent declining values. Niño 4 values peak in June, and there is a hint of a return to Modoki (> 0.5) by September. 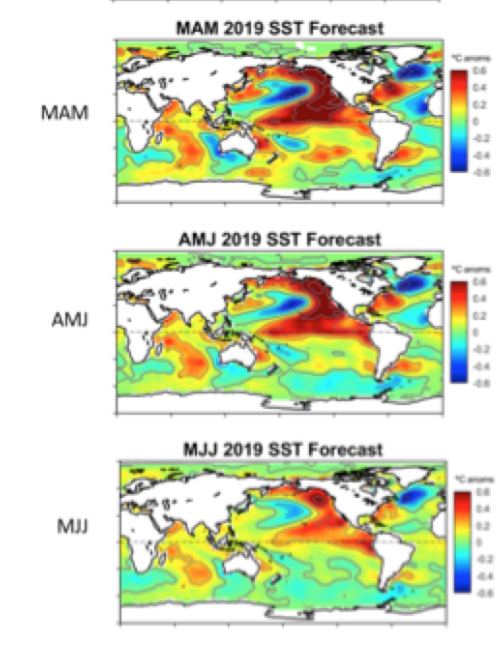 Figure 3: CFAN’s analysis of ENSO forecasts from ECMWF SEAS5, initialized 3/1/19. 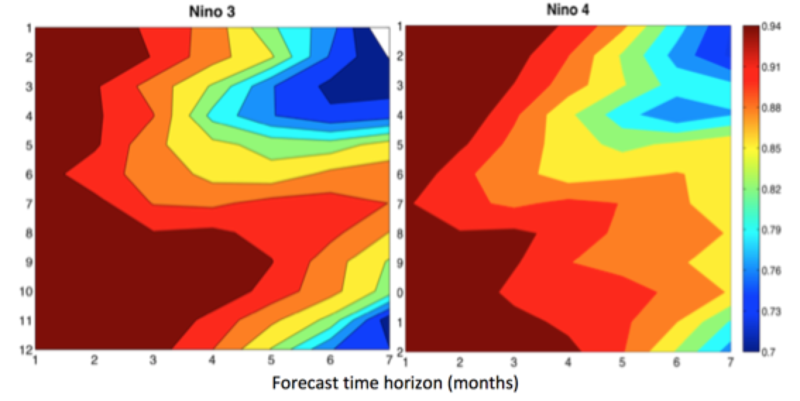 CFAN’s analysis of the ENSO hindcast skill of the ECMWF SEAS5 seasonal forecast model (Figure 4) shows a correlation coefficient of 0.7 for Niño3 and 0.79 for Niño4 forecasts initialized in March for a seven month forecast horizon (September). 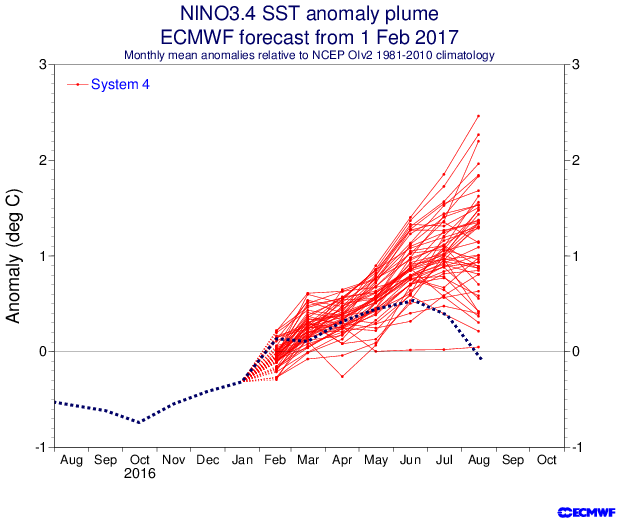 For a forecast initialized on March 1, Nino4 shows greater predictability than Nino4 for a 6-7 month forecast horizon. Figure 5 shows the global sea surface temperature (SST) anomalies for January through February, 2019. Recent anomalies in the tropical Pacific reflect El Niño conditions (Niño 3.4 SST anomaly +0.5°C), with greatest local warmth evident in the equatorial central Pacific. 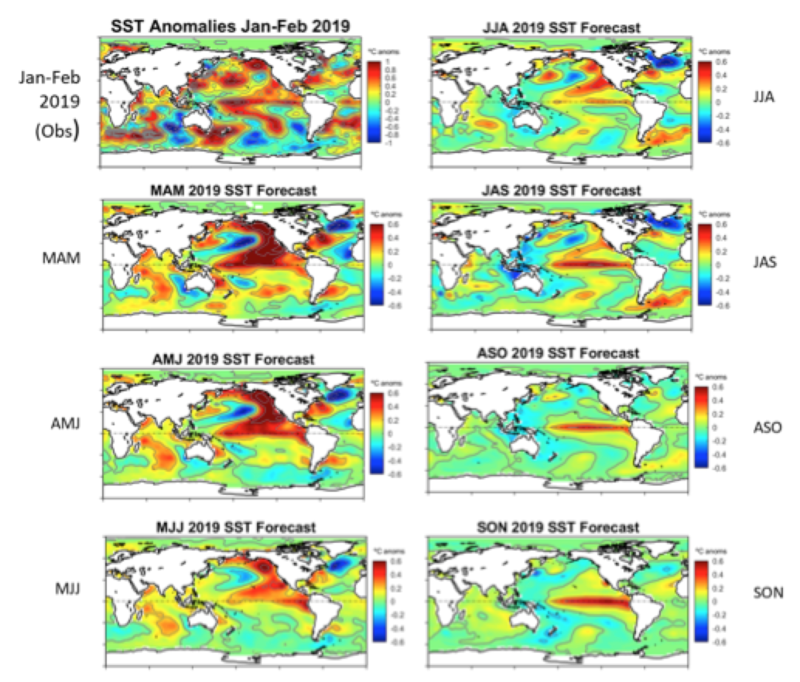 Two methods were used to forecast the seasonal anomalies and evolution of tropical Pacific SSTs during 2019. 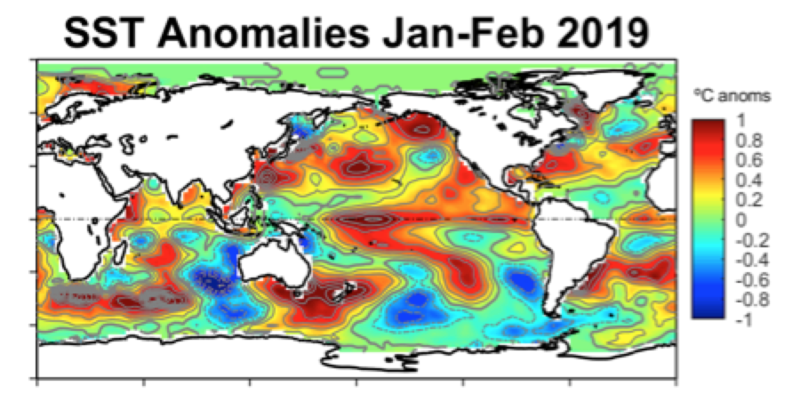 Niño 3.4 index anomalies (Figure 6) were forecast on the basis of recent February-March atmosphere-ocean anomalies and tendencies that systematically correlate with later ENSO anomalies. Climate precursors were identified in globally-gridded variables in the NCEP-NCAR Reanalysis at 17 vertical levels from the surface to the stratosphere. Additionally, we forecast full global SST fields (Figure 7) with a similar scheme based on the 4 leading Principal Components of global SST variability in each season. Both methods give similar forecasts of ENSO conditions throughout 2019. Figure 6. 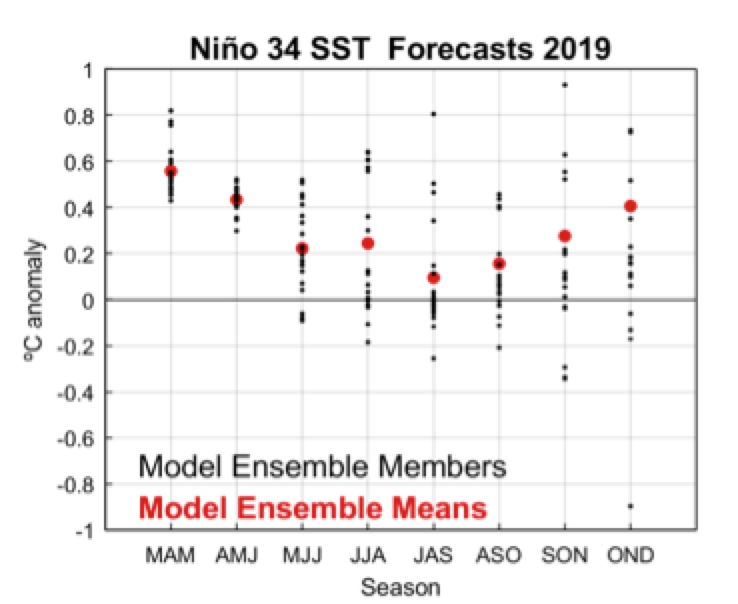 Statistical model projections of Niño 3.4 SST in three-month windows from March to December 2019. Black markers show estimates obtained from ensembles of 20 forecast models, with final forecasts indicated by ensemble means in red markers. Figure 7. Statistical model projections of global sea surface temperatures in three monthly increments through November 2019. Spring forecasts reflect persistence of current moderate El Niño conditions (Niño 3.4 ~ +0.5), and a gradual decay to near-neutral, slightly positive anomalies (+ 0.1 °C) by mid-summer (July-August-September). Spatial SST forecasts in Figure 7 suggest more rapid cooling in the tropical SE Pacific than in the NE Pacific. July-August-September SST anomalies are somewhat greater in the central equatorial Pacific than in the far east, suggesting an El Niño Modoki signature. From late summer to fall, models project a re-emergence toward typical El Niño conditions, charactetrzed by warming throughout the east-central equatorial Pacific to an October-November-December anomaly of +0.4°C. JC note: CFAN’s North Atlantic hurricane forecast will be published next week. This entry was posted in Prediction. Bookmark the permalink. Judith, very interesting. Thanks. I’ve been watching the CFSV2 SSTA forecast updated every 6 hours here. As of the 2019 Apr 4 06z run it is showing increasingly warm SSTA in the mid tropical Pacific through the summer and peaking in November and then weakening in December and January. I have not been watching the CFSV2 SSTA long enough to know how it has performed in the past. I also watch the CFSV2 current SSTA conditions here, in case you (or readers) have not seen it. The latest map is showing some large patches of very low SSTA on parts of the west side of South America and just north of the Galapagos Islands, but still above average in central portions of the tropical Pacific. Most international climate models predict tropical Pacific Ocean sea surface temperatures will remain at El Niño levels at least to mid-year. This would increase the likelihood of the tropical Pacific atmosphere and ocean reinforcing each other, and developing into a full El Niño, with the resultant changes in Australian and global weather patterns. Predictions made at this time of year have lower accuracy than those made in winter or spring and should be used with some caution. We are currently in Full Moon Epoch 6 which lasts from the 25th of April 1994 to 27th of April 2025. I predict that moderate-to-strong El Niño events in the Full Moon epochs preferentially occur near times when the lunar line-of-apse aligns with the Sun at the times of the Equinoxes. 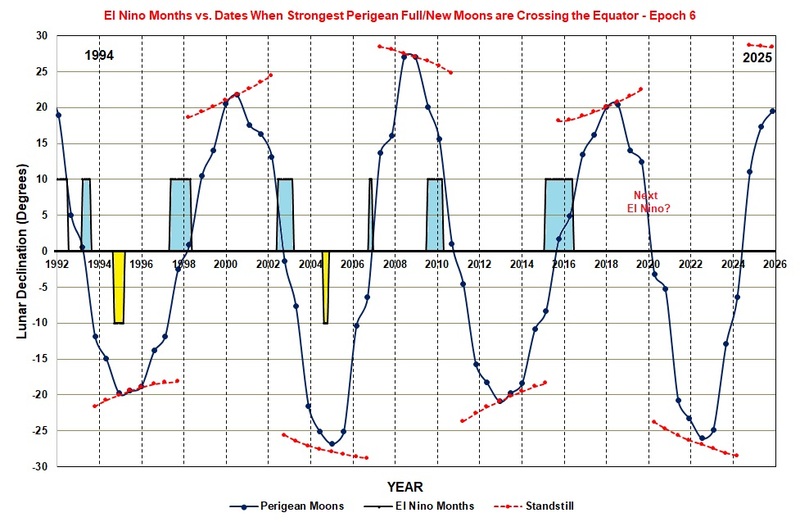 Note that this is equivalent to saying that moderate to strong El Niño in Full Moon Epochs preferentially occur near times the strongest Perigean New/Full moons are crossing the Earth’s equator. In layman’s terms, we just had a supermoon (i.e. full moon close to Perigee – – called a Perigean Full Moon) near the Spring Equinox on March 21st 2019. We like a forecast at the Talkshop. Let’s see how this one goes. Dr Gadian knew exactly what the situation was and the implications of this line of research, He had every facility at his disposal to deal with this issue, but chose to demure. Those decision makers that are working under the presumption that they are being provided with the relevant information for them to make such decisions, have to be made aware that there is serious self censorship throughout the climate industry and they they are being deprived of key information because some find reality ‘too hot to handle’. The research is simple – the problem is academia following the money, not the evidence. Based on predictions of continued reduced solar activity over the next decade and anecdotal observations of colder ocean temperatures off the SoCal coast than I’ve ever seen, Nikola Scafetta’s prediction of a stable to cool climate until 2030 and beyond seems likely. Hilarious. After years of having people lecture me on how horrible the BoM forecasts are. Professor Curry seems to think the Europeans have the goods on ENSO forecasting. She was right last year. If the PDO goes into a positive phase later in the year, and it has been moving that way over the last few months, which is why the anomalies have been going up, – March is very high – 2019 could end up a lot warmer than 2018. There are two critical transitions in the ENSO subsystem. 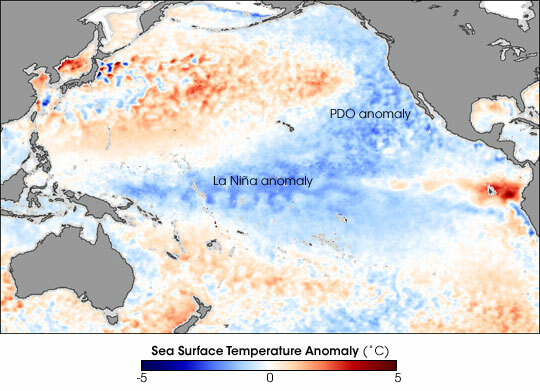 The ‘La Niña normal’ happens with shoaling of the thermocline in the eastern Pacific. 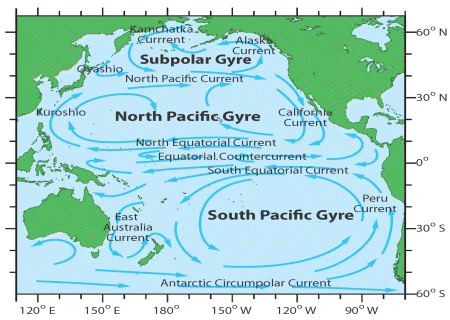 Wind driven currents move along the Californian and Peruvian coasts – in the north and south Pacific Ocean gyres – diverge to the west at the equator. Where the thermocline is overcome upwelling happens. This feeds into baroclinic wind and currents across the Pacific in a La Niña. Over the scale of millennia high La Niña frequency and intensity seems associated with low solar activity. An effect that has been related to three different modes of solar modulation of the polar annular modes. Picking the transition points where prime dynamic causes are overwhelmed by by local and regional feedback is a perhaps impossible task in a canonically chaotic field. A flow field that at its core may even contain random elements in waves, eddies and cloud – in a physical system as resonant as a drum. The other critical transition happens with water piled up against Australia and Indonesia. Some atmospheric instability triggers flow and feedbacks in an El Niña wave sloshing eastward. Currently there is no huge store of geopotential energy in the western Pacific. The Pacific looks to my eye to be primed for a La Niña transition. The next La Niña event is difficult to pick – it depends on when atmosphere and ocean feedbacks kick in – but transitions do tend to happen around April. I think, starting from such a high point, if this is an el nino year and we don’t see the hottest year ever, there’s something seriously wrong with mainstream understanding of ENSO and climate. I note that the Climate Prediction Center of the National Weather Service already has SON (+0.7), OND (+0.9), NDJ (+0.8) and DJF (+0.8). It would appear that a full-fledged El Nino will be declared once the JFM data is available, with temperatures higher than + 0.5.deg. C.
And rather than a gradual decay to +0.1 by mid-summer, I believe that a strong to very strong El Nino should form by late summer. Thank you for the up-date. Nature seems to not be following Dr. Curry’s predictions. c) whether or not you believe a coupling between the atmosphere and the oceans has to be established before a full-blown EL Nino event gets underway. The recent warming of the oceans may meet the minimum criteria for the onset of an El Nino event, however, the atmosphere is not playing along, as there is no concerted weakening of the trade winds blowing across the equatorial Pacific Ocean. My predictions are based upon the Bivariate EnSo Time series (or BEST) index and they only concern moderate to strong El Nino events. This index is currently showing that an El Nino event started in October of 2018. However, due to the way in which this index is defined, this is only a temporary result and it will change in the coming months. If you use the criterion that this index must be 1 for at least 3 months – then we may not know when this threshold is met until the end of 2019. The atmosphere is playing along now. In the past 50 years there is no example of a period 5 in the NOAA record that meets the criteria, which it now does, that was not called either a La Niña or an El Niño. Three months [Oct, Nov, Dec] of Nino3.4 SST anomaly of 0.8 C followed by two months with lower SST anomalies (Jan – 0.5 C, Feb – 0.6 C). At best this supports the contention that a weak El Nino momentarily formed late last year. 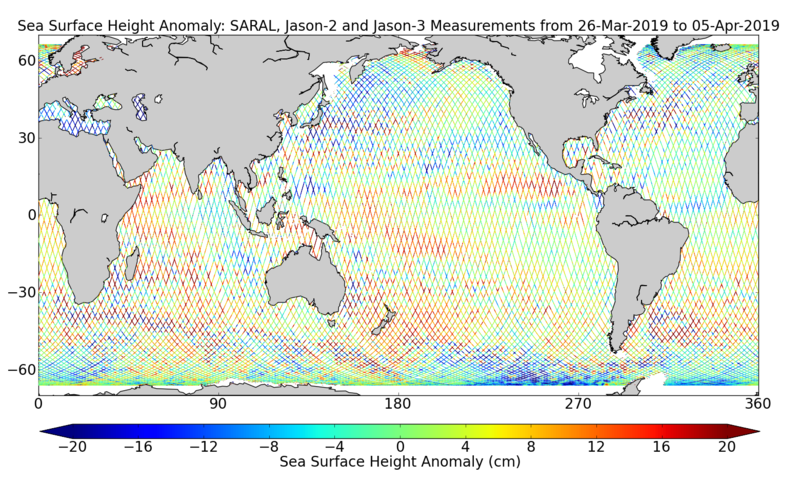 This shows that the SST anomalies are not being supported by the atmosphere, at present. This shows that the “ground state” of the equatorial Pacific has changed in the last 20 years since the big 1997-9 ENSO event. The focus of ENSO variability has moved west from the east Pacific off Peru to the mid equatorial Pacific. In short, it means that El Niños have changed to being Modoki type, not classic Bjerknes ones such as the 1997-1999 one, which might be the last one of its type for a while. Have Modoki event means changed? With the short length of the record showing statistical significance may be a problem. The Pacific tripole temperature index seemed decidedly more negative for near a couple of decades – than it had been over the decades before. As event drifts into climate – can it all be the random quantum universe? God playing dice? Thanks – so it’s a cycle – how surprising is that? Some Korean authors eg An have commented on “ground state”. Is it naive to suggest that this alternates with the PDO? 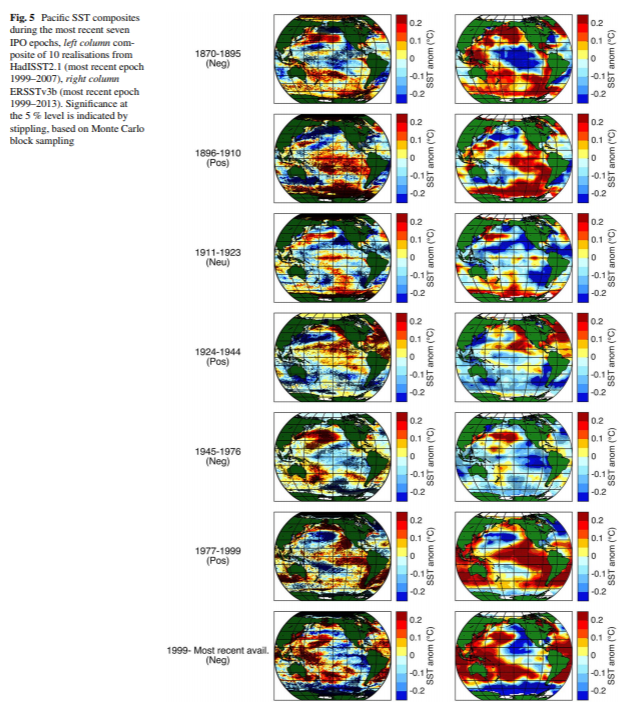 From where do we have such good SST data going back to the 1800s? Sea voyages are long and boring – and this was the era when all sorts of data and collections were kept more assiduously and scientifically. I can believe it. There wasn’t the internet and social media or film industry, people on ships were more likely to do real things with ropes and buckets. Sir Gilbert Walker had 10,000 natives to crunch the numbers. A weak El Nino has already begun. Not according to the Australian BOM. Thank you very much for making your company’s forecasts available, Judith. It is interesting to see several forecast methods in the article and comments: statistics, models, lunar declination. What I miss is the context of the situation. ENSO is a capacitator that charges and discharges energy and is part of the equator-to-pole heat transport system. The heat is not generated in the ocean subsurface, it accumulates there from solar irradiation and when conditions are adequate it is released to the atmosphere as an El Niño. The 2015-2016 big El Niño released a great amount of energy, and the discharge conditions were present since 2014, when the Japanese agency declared an El Niño according to their criteria. Such strong Niños are not too frequent and are usually followed by strong Niñas when the energy recharge takes place facilitated by reduced cloud cover. But not in this case, as the 2015-16 El Niño was followed by very weak borderline Niñas, the capacitator has not recharged properly. This explains why the current El Niño is so weak. There is no sufficient energy in the system for a strong El Niño at this time. And since the capacitator is currently discharging there won’t be energy for a stronger Niño in the near future. We can consider any forecast for a stronger Niño towards the mid-end of the year as improbable, as forecasted by the BoM, or in several comments. The near future of ENSO requires La Niña (recharging) conditions, so looking towards the end of the year or more probably in 2020 a La Niña should start, and there is a good chance it could be a two-year Niña. This is based on the shift in ENSO frequency that took place in the early 21st century that has been reported in numerous articles. Those shifts usually span several decades and a strong El Niño does not mean it has ended. This method requires a reasonable knowledge of the position in the solar cycle. We are currently at the solar minimum. So far February was the month with least sunspots. Positive ONI values (Niño or Neutral but positive) should continue until solar activity picks up pace, probably by the end of the year or the first half of 2020, when there should be a transition to Niña conditions that have characterized the fast ascending phase of the last six solar cycles. Despite the plume covering a span of 2.5 °C (how is that for playing safe?) reality came outside the plume and a La Niña started soon afterwards. Don’t bet against the sun. But not in this case, as the 2015-16 El Niño was followed by very weak borderline Niñas, the capacitator has not recharged properly. This explains why the current El Niño is so weak. 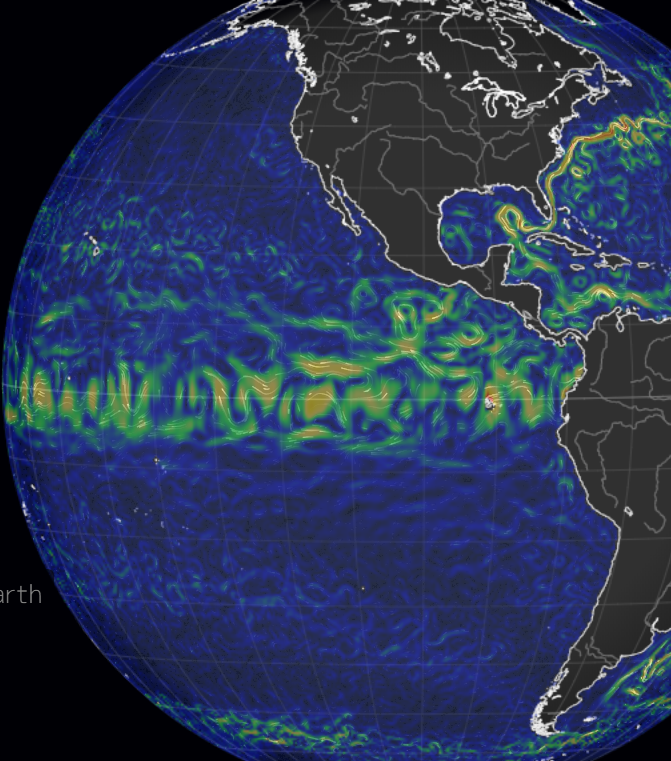 There is no sufficient energy in the system for a strong El Niño at this time. Because the Pacific ground state has changed. There has not been a “true” Bjerknes type El Niño since 1999. Only Modokis. Dai, A., Fyfe, J. C., Xie, S. P., & Dai, X. (2015). Decadal modulation of global surface temperature by internal climate variability. Nature Climate Change, 5(6), 555. Combined with another leading mode of internal climate variability, the IPO explains most of the difference between observed and model-simulated rates of decadal change in global-mean T since 1920, and particularly over the so-called ‘hiatus’ period since about 2000. What are you waiting for? Submit the grant proposal. I see you have the right administration to get it approved on the fly. Don’t forget to request funds for trips to Peru and Australia. My understanding is that an El Niño is a lack of upwelling of cold water. If so then it does not release heat. On the contrary, it is a lack of absorption of heat. You can see the subsurface heat from the IPWP moving from West to East and towards the surface where it disappears from the graph into the atmosphere. Certainly the decrease in upwelling plays a role, but this is heat from the Sun to the ocean that, upon reaching certain conditions, it cannot be distributed to higher latitudes by the normal mechanisms and explodes into an El Niño. To understand El Niño you have to know that there were no Niños during the Holocene Climatic Optimum, they have been increasing in frequency and strength during the Neoglaciation, and have decreased greatly since the LIA. El Niño is the mark of a cooling planet. It is an arch that shorts the poleward heat transport mechanisms releasing a huge amount of heat to space. It is like a valve release to reduce temperature instead of pressure. The main driver of ENSO is the latitudinal temperature gradient. The steeper it becomes the more heat needs to be moved towards the poles through it and the more necessary Niños become. It starts with that first little convection cell in the eastern Pacific. Picking this could be a job for Big Data. In a wildly varying subsystem. Cells drizzle out more frequently over warmer oceans reducing domain albedo considerably. With a warm Pacific clouds dwindle and oceans and atmosphere warm. 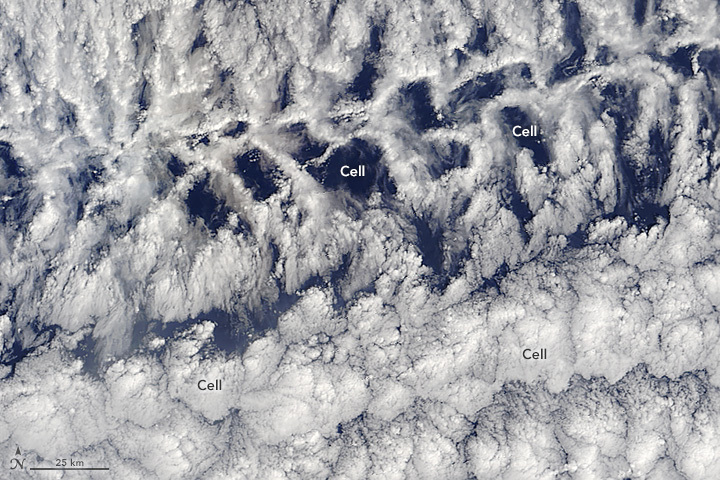 Sure energy is lost as the sky is more open to space but in this low marine boundary stratocumulus – shortwave energy gains from reduced cloud cover prevail in warmer eastern and central Pacific states. And are important in planetary energy dynamics. https://meetingorganizer.copernicus.org/EGU2019/session/31683 “International failure in curbing the global greenhouse gas emissions has sparked studies on diverse and largely hypothetical methods, known collectively as geoengineering, to intentionally mitigate climate change. At the same time, operational activities to modify weather, especially in terms of snow and rain enhancement, are taking place in more than 50 countries. Although these two topics are typically discussed separately, they are in many ways interlinked. Importantly, successful long-term weather modification and geoengineering would alter climatic conditions and the water cycle on local to regional scales. Water is a conservative substance. Its mass on the planet as ice, liquid or vapor is more or less constant. Where it falls as rain depends largely on patterns of SST with a large seemingly random element in turbulent flow. All of the posts i/n this thread exhibit a complete lack of knowledge as to the actual cause of the formation of an El Nino. They occur whenever there is a sufficient reduction in the amount of dimming SO2 aerosols in the atmosphere, which increases the intensity of the sun’s radiation striking the Earth’s surface, resulting in increased warming. .
An El Nino can also form when there have been no VEI4 or larger eruptions for ~ 3-5 years, time enough for all circulating volcanic SO2 aerosols to settle out of the atmosphere, providing cleansing (as happened between 1939-1945–and is happening now). So far, I have seen no exceptions with respect to El Nino formations and the above comments..
Pingback: 2019 ENSO forecast | Watts Up With That? Without understanding the cause any forecasting has very little or no value. When we know more about the cycles of the equatorial Pacific’s tectonic activity, the science might have chance to get there. Looking for a correlation between sunspots and ENSO – or more frequently just eyeballing graphs? Or whatever your latest culprit is? El Nino occur with their own and changeable regularity and are equally likely to occur between sunspot mins as at them. In the longer term we find the subsystem biased to one state or another associated with solar activity. But this by no means enables prediction of the changing patterns of persistence, frequency and intensity of Pacific states. To begin to do that requires an understanding of what the physical components of the system are. The volume of eastern Pacific upwelling is related to flow in the Peruvian and Californian Currents. But the tipping of the ocean state to a cool surface depends on wind and current feedbacks. Looking for a correlation between sunspots and ENSO – or more frequently just eyeballing graphs? Or whatever your latest culprit is? You don’t know much about probabilities, do you? That figure demonstrates that ENSO is under solar control. Think about it. What are the chances that there will be ONI negative conditions right before the solar minimum, ONI positive conditions right after the solar minimum, and ONI negative conditions in the 15-85% increase in solar activity afterwards, for six consecutive solar cycles? Imagine that you set a group of six tests and at each test you throw a coin three times. What is the probability that at all six tests you get the sequence heads-tails-heads? Answer 1 in 8 for each test, 1 in 262,144 for all six tests. The result shown in that figure can’t be due to chance. The probabilities are too small. It is evidence that ENSO is under solar control. So much for those that defend that the change in TSI is too small to have much effect on climate. ENSO events occur irregularly at a frequency of change half that of the 11 years sunspot cycle. So we are entirely likely to get ENSO events at any stage in these cycles. Including everywhere in between. There is no correlation between sunspots and ENSO at short scales- I have tried it. It is all too random. There is no test here – no statistically persuasive analysis possible – no foundational science – only risible eyeballing. Not worth the time and effort for any serious discussion. There is never any breadth of knowledge – just half arsed, wild interpretations of graphics. I can’t express how tedious these fantasies are sans any hint of a solid geophysical or statistical understanding. What are the odds of getting a La Nina – El Nino – La Nina sequence? Pretty damn good I’d say. It happens all the time. Largely in accordance with internal dynamics. And really – people have tried to find Schwabe cycle and ENSO connections. Inconclusively and inconsistently. Look at the damn science and statistics instead of doubling down on this nonsense.. There is no correlation between sunspots and ENSO at short scales- I have tried it. You didn’t try the right way. Now you have the “not discovered here” syndrome that leads you to reject that others can do better than you. The issue with the sun is that its effects are complex. People whose only tool is a correlation never see anything. Getting a shift from Niña to Niño at a specific time in the solar cycle, cycle after cycle does not have such a high probability. I have shown that I predicted the current Niño last July, and I am predicting a La Niña in late 2020-2021. All based in solar activity. I am just betting on a continuation of that pattern that you think is spurious and I am getting it right. If you read my April 8 post, above, I have explained that all El Ninos are associated with reductions in atmospheriic SO2 levels,with 3 identified causes. primarily due to volcanic eruptions, which explains their random occurrence..
La Ninas are caused by increased levels of SO2 in the atmosphere, almost exclusively due to volcanic eruptions. There is a 12-15 month delay after an eruption before a La Nina forms (takes a while for the SO2 aerosols to circulate around the globe). There is no such thing as a La Nina-El Nino-La Nina cycle. Since both are driven by random volcanic eruptions,I agree, that it is a waste of time to look for cycles, etc.,.. i don’t spend much time looking for cycles. I’m more of an ordered random sort of guy. There is an avalanche effect in complex and dynamic systems and the Earth rumbles along in a shifting state space. Northeastern Australia summer rainfall epochs that are fueled by a warm western Pacific. But there are transitions in the Earth system. In frequency in the early 20th century. In a Law Dome, Antarctica ice core. It is all connected. Moy et al’s (2002) record of sedimentation shown above shows ENSO variability over the Holocene. It is based on the presence of greater and less red sediment in a lake core. More sedimentation is associated with El Niño and higher flow. It has continuous high resolution coverage over 12,000 years. 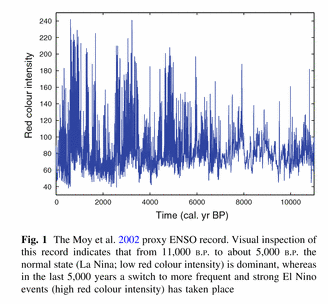 It shows periods of high and low El Niño intensity alternating with a period of about 2,000 years. There was a shift from La Niña dominance to El Niño dominance that was identified by Tsonis 2009 as a chaotic bifurcation – and is associated with the drying of the Sahel. There is a period around 3,500 years ago of high El Niño intensity associated with the demise of the Minoan civilisation (Tsonis et al, 2010). Red intensity exceeded 200 at times. It shows ENSO variability considerably in excess of that seen in the modern period. 1998/99 red intensity was 99. Almost anything sets off an avalanche in the Earth system. But if the state space is ergodic we may have seen it before. You will see a La Nina only 12-15 months after the next VEI4 or larger volcanic eruption. Pinatubo happened during an El Nino and did not cause a La Nina, even though it did lower average global temperatures. Had it occurred during a La Nina, its cooling effects would have been much greater. Picking a quote from RI Ellison “– that was identified by Tsonis 2009 as a chaotic bifurcation – and is associated with the drying of the Sahel. -“, the chaotic incident was more accurately at 3195bce (from tree rings, archaeology, plus– ; Sahel at 3550bce more likely – P DeMenocal) and was far more catastrophic than severe climate event or volcanic (B Henry). A tectonic upheaval is more precise, certainly in the Med. Climate+volcanic were likely just side effects. There was an similar/identical event at 5200bce. The source of the thick sapropel (organic rich) layer at ~3200bce (and earlier at 5200bce) in the Central Med in otherwise clayey deposits is food for thought. Thanks for link/ paper. ‘Flicker’, or in ‘control theory’ known as friction, is very evident in the last 400k yrs. This thread at WUWT : https://wattsupwiththat.com/2017/08/04/paleoclimate-cycles-are-key-analogs-for-present-day-holocene-warm-period/ shows in fig1 a classic case of a bang-bang system with plenty of flicker/friction. See fig 1-basic, 3 and 4. For the last 400k cycle length was approx 100k (eccentricity dictated?? or arbitrary) but the slope flicker/friction appears to be tied to a Eddy cycle forcing/influencing agent. That is evident in the Holocene period where the tipping events have left enough evidence from a number of unrelated sources. The correlations over an 8k yrs period ( https://melitamegalithic.wordpress.com/2019/03/15/searching-evidence-update-2/ ) cannot be accidental. Between 6 -2 bce is different than 2bce -2ce where flicker appears subsiding. La Niña start with upwelling cells of cold abyssal water in the east of Region 2 of the Interdecadal Pacific Oscillation tripole index (TPI). Connections between the sun – or indeed volcanoes – and the shifting Pacific state are remote. Wind and current feedbacks kick in driving eastern Pacific cold V’s. Like other indices of Pacific state the TPI drifted more positive – more El Niña like – in the 20th century. But predicting just when the subsystem will shift – and to what – remains as accurate as examining intestinal auguries. No, La Ninas are NOT caused by up-welling cells of colder water. I have done a study of the 31 La Ninas since 1850, and all (except a few caused by increased levels of anthropogenic SO2 aerosol emissions),are associated with higher levels of atmospheric SO2 aerosols due to volcanic eruptions, with typically a 12-15 month delay between the date of the eruption, and the onset of the Ls Nina (as would be expected). I linked this earlier – a very good explanation of fundamental ENSO geophysics. Currently, they are primarily attributed either to cyclic behavior or to natural variability . However, all of the above questions CAN be answered, simply in terms of changing levels of dimming Sulfur dioxide aerosols in the atmosphere, prior to ~1975 primarily due to volcanic activity, but, thereafter, also due to changing levels of anthropogenic SO2 aerosol emissions. . So – for the post hiatus at least – a reduction in cloud over the Pacific – and a smaller effect from sulfur – the latter more likely volcanic than anthropogenic. ENSO is a charge discharge oscillator. Trade winds pile warm surface water up against Australia and Indonesia. At some stage winds falter and mounded water sloshes eastward. 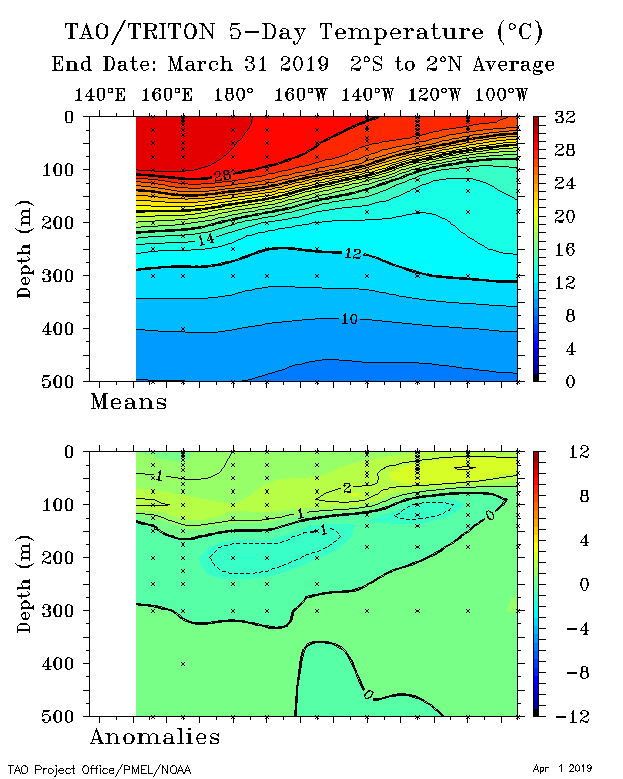 But La Nina start with a reduced thermocline in the east and upwelling. That is perhaps the wrong view on temperature. While the ‘operator’ in Thermodynamics is the absolute temperature, however it is perhaps the wrong view on other matters. It might be even worse where climate matters, as the temp anomaly in holocene seems to indicate (don’t know if its cause or effect). One may note (and compare) the dates to links in my earlier posts. But had the paper dug a bit deeper into specifics it would have been more revealing. Re the ‘ imposing megalithic temple’, these are calendars that tell a lot in their design and dimensions; and the abrupt changes. And in the last sentence ‘came by sea’; no, there is evidence of an exodus in/post 3200 and another around 2300. The devil is in the detail (and in the above links, primarily tectonic). A big fat La Nina is ahead (2019-21/22), similar to the 1954-56 one. Hi, I am a laymen here but I think I have read in awe just about every single episode given here, over the years, and was able to stay awake long enough to finish many of them – but I have a question. In discussing the global temperature of our planet – what should the temperature of the planet be? There will always be weather ahead in the equatorial Pacific: warm weather. So warm that it will cause periods of faster and slower warming on top of the warming trend caused by the control knob of the current climate situation: anthropogenic CO2. Which is why the 10-11 and 11-12 La Niña events, about as big and fat as it gets, got you absolutely nothing. I predict a quick and sudden end to the current weak El Nino – possibly replaced by a change to La Nina. Currently there do not appear to be any ‘little seeds” of warmth in the west. Quite the opposite, there seems to be some cooling there. So, will we see in the next few weeks, if these ‘little seeds’ of coolness in the west propagate eastwards to become larger areas coolness in mid-Pacific?